One of the most significant meetings of Albert Tucker’s thirteen-year sojourn in Europe was with the Italian artist, Alberto Burri (1915 – 1995), renowned for producing abstract images that blurred the boundaries between painting and relief sculpture. This introduction to polyvinyl acetate (PVA) as a new medium for his work enabled Tucker to build up texture without having to use vast amounts of valuable paint2 and heralded the beginning of his production of paintings in which the scraped, scratched, gouged and sometimes even sculpted surfaces make a vital contribution to the expression of their meaning. Tucker discovered that PVA could be mixed with almost anything – sand, dirt, sawdust and feathers – and for Wounded Man, 1958 he used Portland Cement combined with pigment. 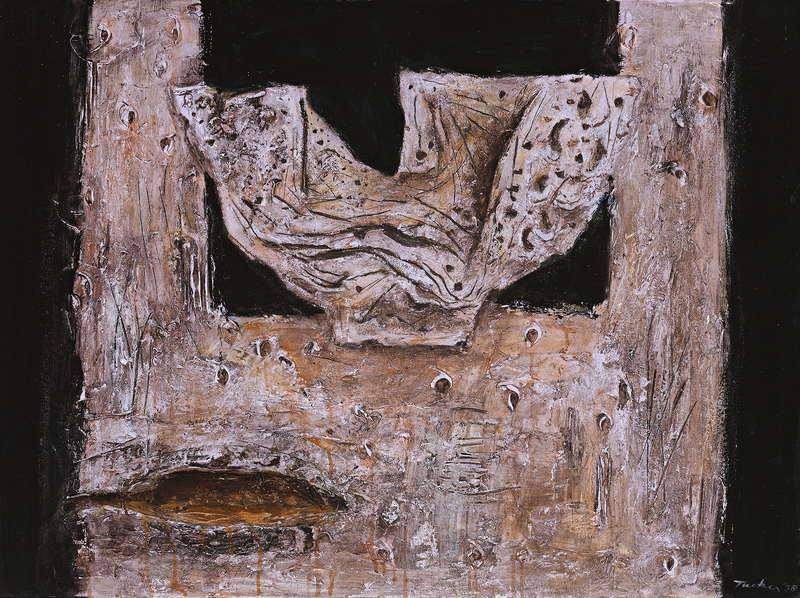 The surface of the painting is heavily textured, scored with a variety of expressive marks that Tucker uses to define pictorial elements such as the anguished facial features of the figure, and to create a rich overall patina reminiscent of dry, cracked earth – something that reminded him of Australia. Wounded Man is an austere and essentially abstract picture that uses a simple combination of geometric forms to depict a human figure, his head looking upwards, arms raised and a dramatic open wound in his side. The crescent-shaped head is a distinctive motif within Tucker’s oeuvre that can be traced back to sources as diverse as Picasso and Etruscan sculpture, as well as to the lips of prostitutes in his Images of Modern Evil series. Living in Italy during the early 1950s, Tucker was struck by what he described as the ‘atmosphere of Christian tragedy in every museum, every church, every public building … mutilations and blood and human agony and despair … that the medieval and Renaissance artists would paint with such lavish and loving detail and care’.3 Wounded Man clearly shows this influence, recalling depictions of Christ on the cross and the martyred Saint Sebastian, subjects in which Tucker found a natural affinity as someone with an inclination towards themes that confront the dark side of human nature and experience. While the iconography of Wounded Man is more closely related to Tucker’s religious subjects of the earlier 1950s, its technique prefigures the so-called ‘antipodean heads’ that he began painting at this time and for which he became well-known following his return to Australia in 1960. It was in these images that Tucker so vividly expressed one of the central themes of his oeuvre, the fusion of man and his environment and the inevitable tensions within such a relationship.